For our bridge 2 project intervention project, we chose to occupy the space surrounding the Slocum Memorial—a monument dedicated to the nearly 1,000 german lives lost when the Slocum Steamboat engulfed in flames. 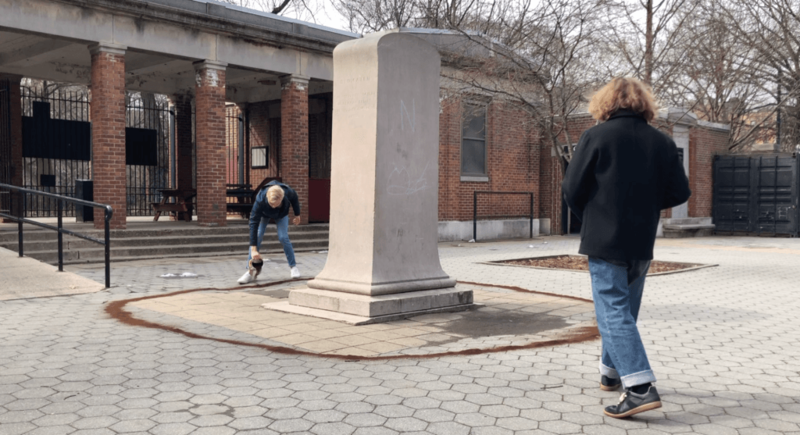 Taking inspiration from the installation artist Douglas Huebler, we wanted to track park goer’s present interaction with the memorial by surrounding the site with coffee grounds and documenting the displacement/disruption that occurs. 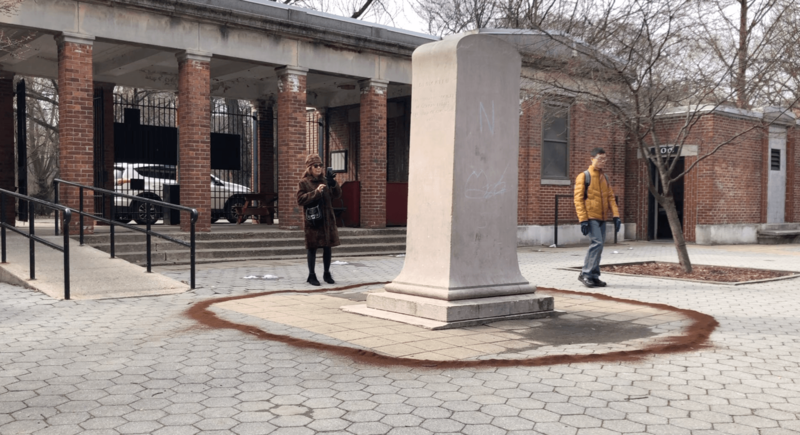 The coffee grounds will cover the maximum radius where people can read the monuments inscriptions, thus forcing those wanting to engage with it to walk through the coffee. Coffee is a very intentional material, as it holds very strong connections to German culture and cuisine. 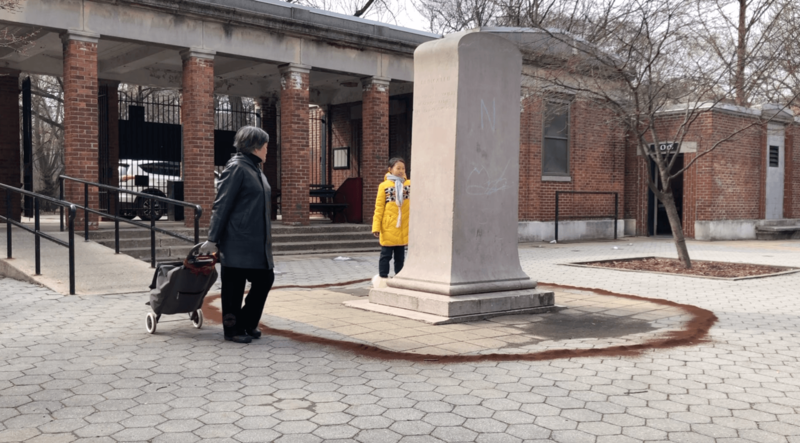 With this project, we are exploring the concept of historical displacement—that is, people’s growing disassociation with tragedies as time separates them. 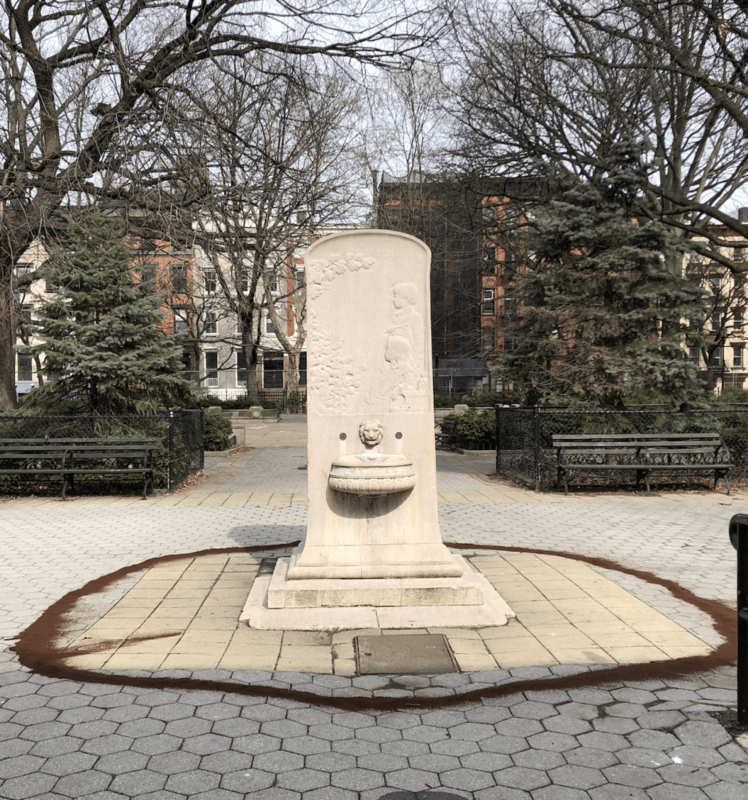 The sinking of the Slocum was the largest loss of life before 9/11, yet it’s placement in the park suggest a lack of importance, isolated behind public bathrooms. Our project also incorporates the idea of cultural holds on a place—their strength, longevity, and displacement with time. What was once a family park for the strongest German borough in New York is now a ground that focuses on the needs of the gentrified neighborhood surrounding it. Noah and I set up the installation at around 11 am and left at around 2 pm on Friday. 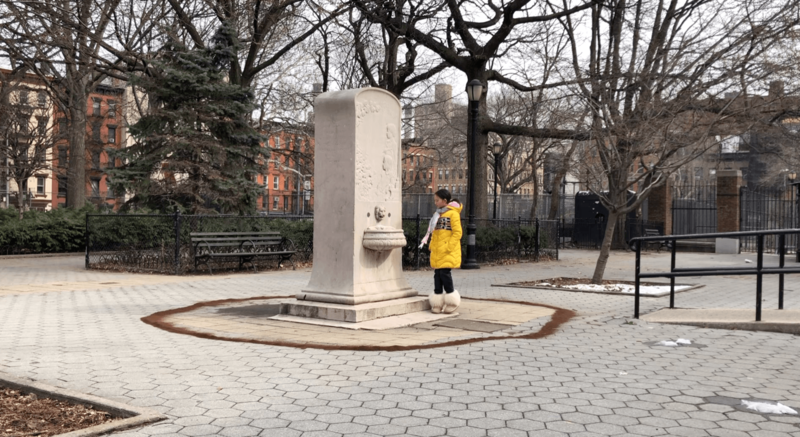 While we were there, we recorded sounds and documented park-goers interaction with the coffee ring and monument. We returned at around 5 pm to ensure that everything was clean, as we talked to the park employees during set up and they generously offered to help. 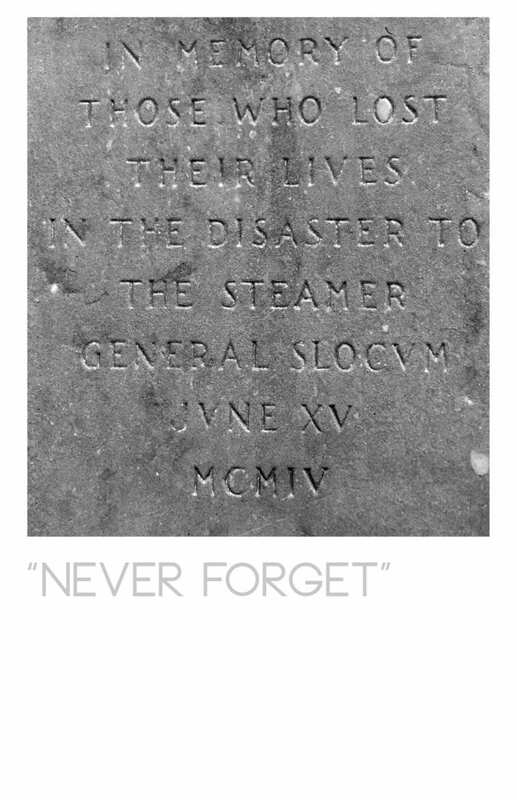 Following our installation and documentation, we chose to create a set of diptych-like posters with the phrases “Never Forget” and “Forgotten”. We realized that a statement, no matter how powerful, means nothing without an audience, so the posters served as a way to reach more people with our message—that no one cares anymore. A common phrase in association to 9/11, “Never Forget” makes sense considering the magnitude of tragedy associated with the event. However, as history has proven, people become growingly disassociated with tragedy as time progresses. 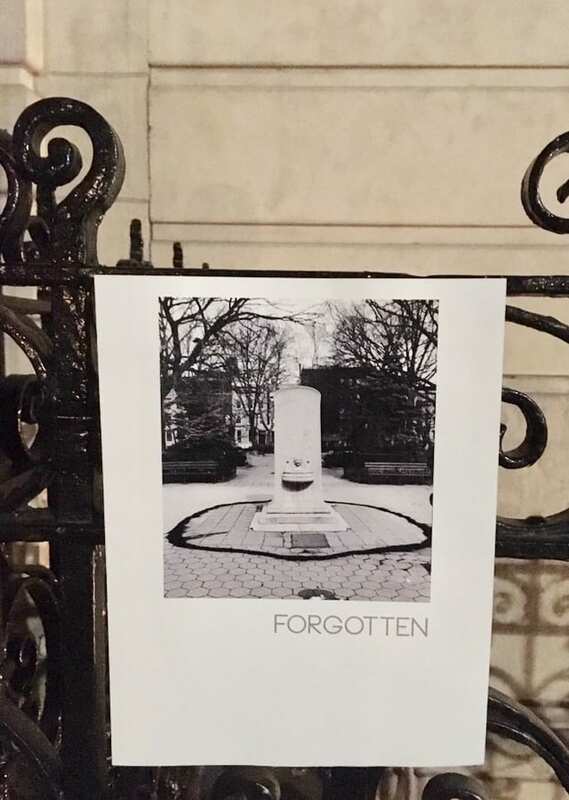 Perhaps the weight of the 9/11 tragedy will remain relevant for longer because of the sheer size and cost of its memorial, but the Slocum Memorial did not receive that attention or funding. Thus, the word “Forgotten” borders the second half of the diptych with a screenshot of what the bulk of our project documentation looked like—empty. I designed the posters, then tasked Nickolas and Sarah to hang them up around the park. They did this two days after our initial intervention. I do wish I was more clear in instructing how the posters should be set up and how documentation should be executed, as those two things were lacking in the 2nd phase of our project. Reflecting back on the project at large, I’m satisfied with where we took it and the quality of our documentation. I only really have two concerns about our project. 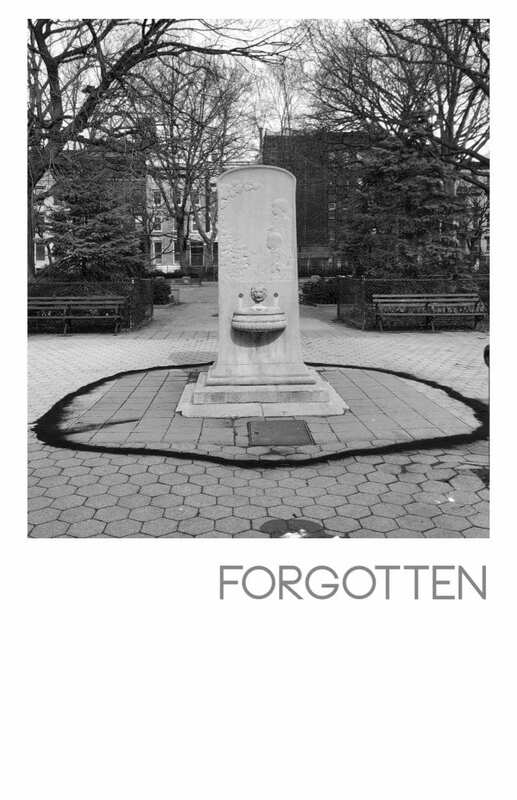 The first was the unintentional power of a circle around a monument. 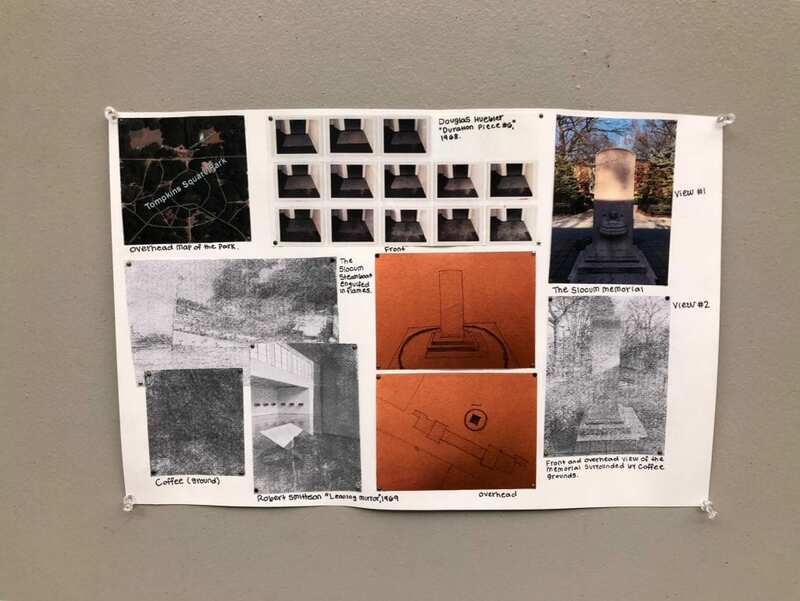 As one park-goer pointed out, spreading coffee ground around the monument looks very processional and religious, potentially skewing people’s natural engagement with the monument out of fear of being disrespectful. The second concern was the information associated with our final poster phase. I wish we made a URL with links that explained our work, our results, and what that means as well as just informing visitors of the tragedy at large. Overall, though, I think our project reached our goals and expectations.